Companies are using digital technologies to add business value like new sources of revenue and to help improve their customer’s experience. 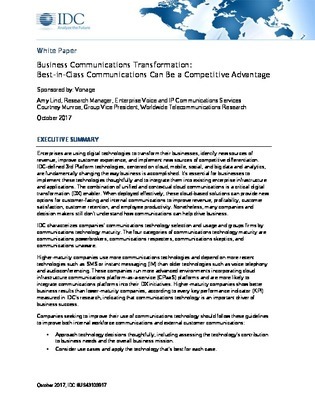 In this IDC white paper, learn how companies across different industries are seeking to improve their UC maturity by thinking strategically about their business needs and understanding the key considerations for selecting UC providers. Does it require differentiation or customization? Is it static, or will it be changing? What systems integration will be required?